LOS ANGELES — Magic Johnson had the title he’d always wanted. He had the power to guide one of the most important franchises in sports, carte blanche. It’s awesome being that guy. And Magic Johnson is great at it. Johnson enumerated all sorts of unsavory things about the job during an hourlong media session that spilled out into the hallways and corridors of Staples Center before the Lakers’ final game of the season. He didn’t like: “the backstabbing, the whispering. I don’t like that. I don’t like a lot of things that went on that didn’t have to go on. He really didn’t like having to make the decision on whether to retain embattled coach Luke Walton. “She gave me the power; that is the same page. I could have done anything I wanted to, tomorrow. But I decided to step down,” he said. But what he really didn’t seem to like was the negativity he has faced this season. Negativity he couldn’t charm his way out of. There aren’t many situations in life that Magic Johnson hasn’t been able to charm, compete or fight his way out of. The ones he couldn’t — talk-show host, Lakers coach and now Lakers president — he got away from quickly. They might love each other, but telling the world before telling your family — not to mention your boss — is weak. Yes, being the Lakers’ president is hard, and if Johnson didn’t want to keep doing it, he didn’t have to keep doing it. But he could’ve talked it through with Buss and planned his exit, instead of leaving the franchise in an embarrassing lurch. People have jobs they don’t want to do and can’t do. They find a way to do them, or an acceptable way out of them. Those close to Johnson say he was “deeply offended” by the constant accusations of tampering that followed him and essentially forced him into the shadows this season. In an impromptu, wide-ranging news conference, Magic Johnson explained why he was stepping down as Lakers president. Here are the highlights. 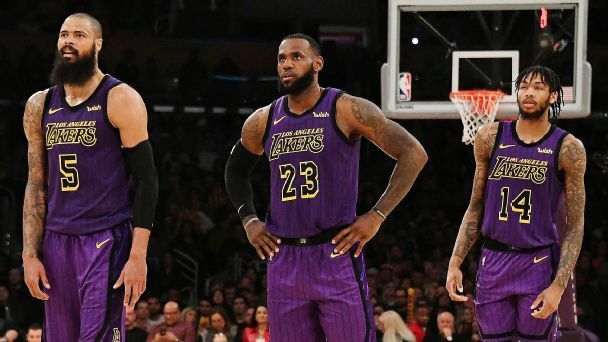 The Lakers need new leadership before a crucial offseason. So, what’s next? When he did talk, he always said too much. That’s how he always has been and part of the reason he has been so beloved. There’s literally an NBA award named after him, the Magic Johnson Award, given to the player who has the best cooperation with the media. Magic was always that guy, as a player and later as a public figure. He’s great at it. But that’s not what being an executive is. Not in a league for which information is not only commodified, but weaponized. Magic never figured out how to play that game. He’s best when the cameras are on. In the shadows, he lost his way — and his identity. Jeanie Buss was just as stunned as the rest of the world to hear Johnson’s resignation. A few hours later, she put out a classy statement and tweet, even as she and the Buss family processed the situation. In addition to being stunned, those close to the family said they were sad, angry and disappointed. She spent the rest of Tuesday night huddled with general manager Rob Pelinka and several close advisers at the team’s headquarters in El Segundo. Johnson’s quotes about Pelinka fell far short of a ringing endorsement, which left many wondering whether that factored into his decision to step down. Lakers sources strongly shouted that notion down even as Johnson’s quotes suggested otherwise. In a three-hour meeting Monday, Buss had once again made it clear that she was giving Johnson the power to make the basketball decisions for the franchise, including the power to fire Walton and hire whichever coach with whom he believed he’d have a better rapport. He either didn’t want that power or couldn’t handle it. So now that power is right back to where it always should have been — with Jeanie Buss. She has to start using it, instead of looking for someone else to pass it to.